Fritjof Capra is well known for scientifically proposing that the universe, including humans, is a complex web of relationships, and for examining the concept of universal unity in religious beliefs, especially Buddhism. 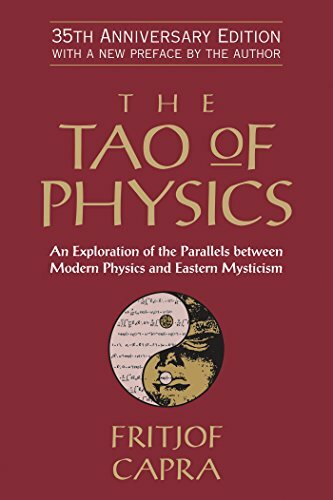 Originally written in 1975, The Tao of Physics is the classic book about the integration of everything. This reviewer read the 2007 printing. The final chapter updates Capra’s thinking to that date. Then in 2014, with biochemist Pier Luigi Luisi, Capra completed his latest book, The Systems View of Life. That book details life sciences as well as physics. At 79, Capra is still going strong. He is a director of the Center for Ecoliteracy, which concentrates on child education, and he conducts his Capra Course for adults. From 1975 onward, Capra’s message has been that the universe is a complex network of relationships between bundles of energy. This reality exists, forever beyond full human comprehension, and acts of observation change it. For example, physicists have known for decades that the energy state of a sub-atomic particle changes by any process of observing it. Therefore a quantum particle is not a solid as we conceptualize on a macro level, but a bundle of energy forces interacting with each other. In 1975, quantum entanglement was unknown, and it reinforces the idea of the universe being a web of connectedness. The spin of a particle that has interacted with another flips instantaneously when the other flips. No known signaling explains this. The sympathetic particle flips faster than can be prompted at the speed of light. Capra offers many more scientific examples, but goes off on a search for how we can psychologically accept the puny capacities of human perception, so that all views of reality are wrong or incomplete. He turned to religions, notably Buddhism. The Buddha did not contemplate the great Western philosophical questions of our purpose. Rather, he examined the causes of suffering in life: we seek things that we can never find and want what we can never have. Therefore we suffer from a wrong point of view. We want to believe that everything is firm and fixed, but all is transitory. We are deluded that our observation of a small chunk of reality represents the whole. Buddhist enlightenment is a sensation that all things are connected, a great oneness that cannot be expressed in words – certainly not in words that focus attention on some trivial part of the whole. In 1975, Capra was convinced that Westerners could accept that all things are connected through Buddhist-like meditation. By 2014, he accepted that few Westerners would dedicate the time and patience to take this route to enlightenment. Instead, today the Capra Course offers his unified view of physics and biology as a basis for psychological freedom from all fixed beliefs. In this new view, we should accept a world full of paradoxes and polarities, Yin and Yang. Can you hold opposing ideas in mind at once? Can you transform from being self-centered to being in awe of a vast universe of reality in which you are merely one actor? Observe and study patterns of energy, not things. Processes of change are primary. What you see depends on how you look at it. Look from many angles. We understand only through the self-consistency of observations, data, and models. From these we may extrapolate parallels and analogies. There is no ultimate truth, merely approximate descriptions. None can describe everything, and all can change. Systems and knowledge are made of building blocks. Organic bodies and systems work like machines. Human life is a competitive struggle for existence (too little collaboration). Patriarchal men should control everything (so female subservience seems natural). By 2007 The Tao of Physics warns that human survival is possible only with a radical change in in methods and values that guide science and technology. However, it concludes by comparing and contrasting mysticism and science. Scientists deal with limited and approximate descriptions of reality. Mystics are less interested in explaining anything than in affirming non-intellectual feelings of unity with all things, or at least with powers greater and more mysterious than man. Capra has now deployed this strategy to deeply change thinking. Invite a systems understanding of science and ecology – or “ecoliteracy.” If people grasp that all nature and its environmental hazard are connected, will they lead a rapid, widespread shift in human culture to deal with them? Capra sees that this shift must be very fast compared with historical cultural changes that bog down in what I have previously called nostalgia drag (going back to the future) and tribal competitions for control. Capra and the Compression Institute share the apprehension that this enlightenment approach is too little, too late. According to Walter Scheidel, humans have rarely if ever made a huge cultural shift without violence, so thinking that any approach will work this time faces long odds, but we will take them. Psychologically we have to be optimistic. The kind of hope I often think about….I understand above all as a state of mind, not a state of the world. Either we have hope within us or we don’t; it is a dimension of the soul, and it’s not essentially dependent on some observation of the world or estimate of the situation…. [Hope] is not the conviction that something will turn out well, but the certainty that something makes sense, regardless of how it turns out. Next:Can We Learn to Think Like Nature?